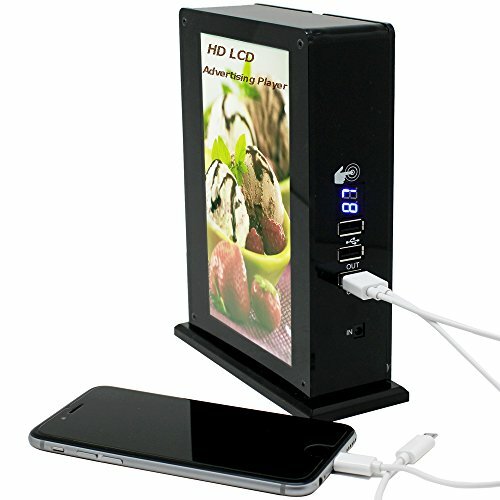 The owner can put the menu or other store's promo on the charger's advertising frame, so that advertising can be in a conspicuous place to display. What's importantly, it has 2 display way, one side is video, the other side with picture, it's so convenient. It is not only easy to order for customers, but also to provide customers with the convenience of charging because it has 3 USB ports. •20000mAh Power Bank for Phone, Tablet Pad, any USB Charge. •Picture Frame: When it is used at home, you can put your favorite pictures(it means electronic pictures) in SD card, and then dynamically displayed on the Muti-function Power Bank. Also, you can put the photo(paper) in other side, two choice, more convenient. ••Advertising Player: At the same time, it can play adv(no speaker). 7 inch LCD screen will be a wonderful enjoyment. The best choice for your shop and a good gift. GOOD DAY! ★ [TWO KINDS ADVERTISING DISPLAY IN TWO SIDES]: One side is LCD screen to play videos , the other side with paper to display pictures. It's very convenient for you to play videos or change the pictures. Two choice, more convenient. ★[ 7 INCH TFT HD LCD SCREEN]: High lighting LCD back light, aviation level aluminum material, display HD advertisement. So you don't worry about that customer can't be attracted to your advertising. ★[ LARGE BATTERY CAPACITY and 3 USB OUTPUT]: 20000mAh power bank and 3 USB ports make it easy for you to enjoy your relaxing time with your friends and family. ★ [8GB USB MEMORY, MORE EASE]: With 8GB memory, you can transform your video and pictures more to there from the computer or the phone that it's very ease. ★ [APPLICATION]: Best choice for public places, such as Restaurant, Cafe, Hotel, Bar to display advertisement and to decorate as well as basically a power bank. If you have any questions about this product by Eniki, contact us by completing and submitting the form below. If you are looking for a specif part number, please include it with your message.